This week’s #SundaySupper features Back to School dishes that can be prepared in 30 minutes or less. Even though The Grillmaster and I don’t have kids at home, there are still nights when we need quick meals due to meetings or other commitments. 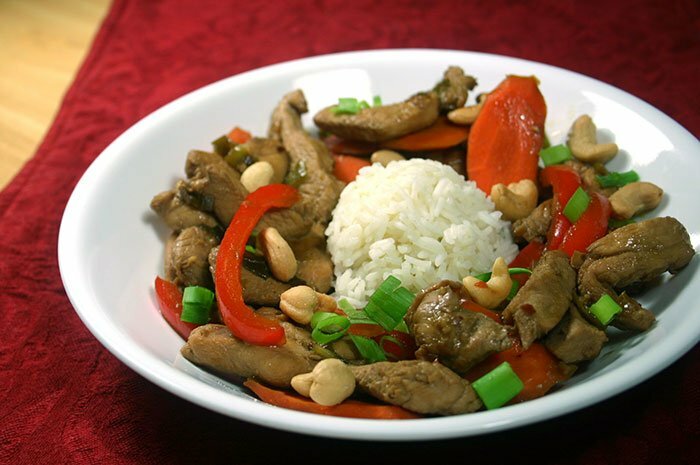 In these situations, we usually pull out the wok and whip up dinners like Chicken Cashew Stir-Fry. We often serve this dish over baby spinach or other greens. We get an extra boost of fiber and vitamins, we don’t have to take the time to cook rice and I don’t have to worry about the extra carbs. If you want to serve this stir-fry with rice, cook a double batch. The next night you can combine the leftover rice with chunks of ham, onions, peas, carrots and eggs to make some quick and tasty fried rice. You could also serve the chicken cashew stir-fry over low-carb cauliflower rice. I actually timed myself when I was preparing this stir-fry. I shooed The Grillmaster out of the kitchen and pulled it off in about 24 minutes. Your mileage may vary, especially if you have kids underfoot. Use pre-cut fresh or frozen mixed vegetables and substitute them for the red bell pepper and carrots. Use minced garlic from a jar. Use chopped ginger from a jar. Use roasted cashews and skip the step where you toast the raw cashews. Do the first step (marinating the chicken) in the morning. It will save you time when you’re ready to cook and allow the chicken to develop more flavor. Chop everything ahead of time and place each ingredient in a separate bowl next to the wok. Mix the tamari and orange juice in a small bowl ahead of time too. What’s your favorite quick meal to prepare on a busy night? In a medium bowl, combine chicken, 2 tablespoons tamari and red pepper flakes. Set aside. Toast cashews in a small nonstick skillet (don’t use any oil). Stir often, for about 3 to 4 minutes, until cashews are lightly browned. Remove from heat and let cool. Heat 1 tablespoon olive oil in wok over medium-high heat. Add garlic and ginger; stir-fry for a minute or so, until fragrant. Add the chicken and stir-fry for 3 to 4 minutes, until no longer pink. Add remaining 1 tablespoon olive oil to wok. Add the carrots and stir-fry for about a minute. Add the red bell pepper and stir-fry another 3 minutes or so, until vegetables have softened, but are still crisp. Add half of scallions and cook for another 2 minutes. Return chicken and its juices to wok. Combine orange juice and remaining 2 tablespoons tamari in a small bowl, then add to wok. Increase heat and bring to a boil, stirring often. Let boil for 30 seconds, then remove wok from heat. Garnish with remaining scallions and cashews. The #SundaySupper gang will be sharing Back to School recipes that can be prepared in 30 minutes or less all afternoon on Twitter, Facebook, Pinterest and Instagram on Sunday, August 26, 2012. We will also have a live chat at 7 p.m. EST on Twitter and will be using the hashtag #SundaySupper. We look forward to answering questions, giving tips and inspiring you to spend more time Around the Family Table with those you love! Thanks to Nicole Cook of The Daily Dish Recipes for hosting this event. This looks yummy! Thanks for stopping by Granny’s Down Home Southern Cooking. Glad you like the recipe. I grew up the same way. My mama used crackers, onions and egg as her base. I had to make it more fancier to get my grandson to eat fish. LOL! Great prep tips for making quick meals! Those are so important when the goal is getting dinner on the table fast. I love a good stir fry and the crunch of cashews sounds really great. I always try to get supper on the table quickly and if I’m in a pinch for time I usually make breakfast. 24 minutes! Isn’t that amazing that such a wonderful dish can be made in that time! Thank you for sharing! Love the idea of using cashews! It´s not used often enough. Great recipe! I love cashews in a stir-fry! Great time-saving tips as well, thank you! Stir fry is a quick and easy dish to prepare. I adore cashews! I love making stir fry and I love bringing in the veggies. Great dish! Oooh, sounds great! I really like nuts in stir-fry’s too. Cashew-Chicken has been one of my favorite dishes for as long as I can remember – I always seek it out if we go out to eat (at a Chinese restaurant), but don’t make it nearly enough at home. Thanks for the inspiration…this sounds absolutely perfect and I’ll be making it for dinner soon! Stir fry with nuts has to be one of my favorite things. oh cool u even add orange juice to your recipe. never thought of adding this, but it makes sense! thanks for sharing! I love the addition of nuts in anything. This looks really good!! I so love stir-fries–they always end up so flavorful and come together quickly! Oh my goodness you made chicken stir-fry, one of my favourites, and you added cashews. I think I am in love! And the addition of orange juice intrigues me. I love my handy trusy wok too. 304 calories only! I should definately try this combo. 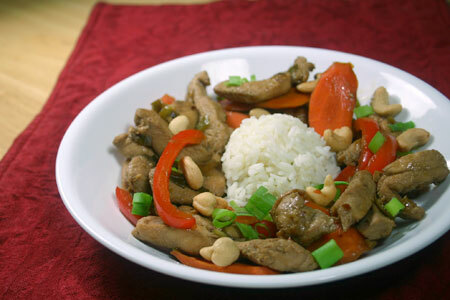 Stir frys are so great for quick meals – this one looks flavorful. Love anything with cashews! Stir frys are so quick and easy! Thanks for your take on this classic! Way to go with the timing – I don’t think my meal actually made it under the 30 minute mark but shhh, don’t tell! I love making stir-fries and this one looks and sounds super yummy (especially with the cashews, one of my favourite nuts). Mmm, I can also imagine the flavour punch provided by the addition of orange juice. I love a good stir fry! Never tried adding orange juice, but will give this a whirl! Thanks for sharing!